PROVIDENCE, RHODE ISLAND (February 2, 2017) - When Rhode Island PBS put out the call in December for the next Our Town locations, residents from towns across the state stepped up. By the time the January 31 deadline arrived, it was clear that two towns had highly enthusiastic support. "We are proud to announce that by popular decision, Smithfield and Bristol are the next locations for Our Town in the 2017 cycle," said David W. Piccerelli, president of WSBE Rhode Island PBS. "We sincerely thank all those who submitted entries - community pride was strong and clear - and we are thrilled about the winners." Smithfield will be featured in a documentary televised in September 2017, and Bristol will be featured in March 2018. Enthusiasm has grown for the Our Town project - now beginning its fourth cycle - thanks to the fun and success of the first five projects, Piccerelli said. Our Town: Glocester, the first documentary in the series, debuted in December 2014, followed by Our Town: North Kingstown in September 2015 and Our Town: Portsmouth in December 2015, and most recently, Our Town: West Warwick in September 2016 and Our Town: Westerly in December 2016. "The comments that we and the participants received in relation to each of these projects have been very inspiring," said Jodi Mesolella, project director, and director of membership and special projects at Rhode Island PBS. "We're looking forward to building on that energy as we take the project now to Smithfield and Bristol." Our Town is a community project wherein neighbors become filmmakers and tell the stories of Our Town. Part fund-raiser, part community builder, part historical and cultural documentary, and part "day-in-the-life" video scrapbook, Our Town shares with viewers the local legends, historical happenings, and backyard secrets of the particular town and its villages - untold or uncelebrated stories that capture the essence of the town. "Our Town gives the community a platform to share stories and perspectives on the town in their own voices," Piccerelli said. "It's also a meaningful way for us at the station to connect with our communities." Residents of Smithfield and Bristol are especially urged to participate, but one need not be a resident of the particular town - just have a great town story to tell. Planning meetings and a workshop lead up to the period allocated for filming. During the planning meetings, participants discuss and choose the subjects and locations they want to include in the documentary about their town. "This kind of collaborative group project invites residents to be more involved with Rhode Island PBS, and with each other," said Ms. Mesolella. "The content is decided exclusively by the participants. They pick what will be in the film. If someone has an idea for a story, please come to the planning meeting and share it. We're looking forward to seeing what Smithfield and Bristol decide to do." In each town, Rhode Island PBS recruits up to 20 to 25 volunteers with video cameras. For this project, there are no restrictions as to age or experience and there is no cost or compensation to participate. For those with a story to tell but no camera to capture it, Rhode Island PBS has a camera to lend by appointment and with a security deposit, which is returned when the camera is returned. "We will offer guidance, technical advice and support to our volunteers, but this is definitely their story as told by them about their community," said Nicole Muri, project producer. Video recorded by the volunteers will be edited together by Rhode Island PBS to create a one-hour film of each town. The first planning meeting in Smithfield will be the week of March 6th, with two opportunities for volunteer filmmakers to attend one technical workshop in the week of March 13th in town (location to be arranged) or the week of March 20th at Rhode Island PBS studios. The deadline for all video submissions is May 5, 2017. Bristol's first town planning meeting and technical workshops will be in October, with the filming deadline November 27, 2017. Although dates for shooting footage will be set, videographers need not wait, and are encouraged to shoot footage of any relevant event or storyline anytime up to the deadline for video submission. 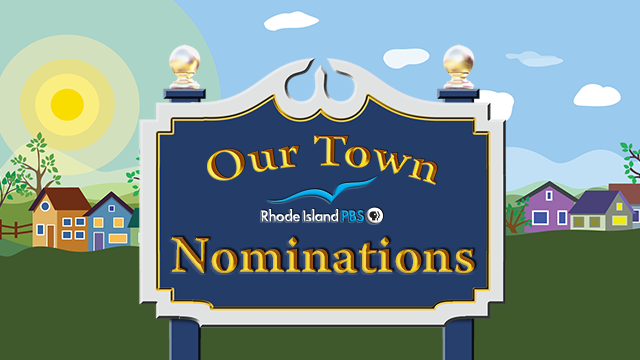 For information about joining the Rhode Island PBS Our Town project, and for details about meetings as the dates approach, visit ripbs.org/ourtown, or call Jodi Mesolella (project director) at 401-222-3636, extension 209, Nicole Muri (producer) at extension 225, or email ourtown@ripbs.org. WSBE Rhode Island PBS transmits standard-definition (SD) and high-definition (HD) content over the air on digital 36.1; on Rhode Island cable services: Cox 08 / 1008HD, Verizon FiOS 08 / 508HD, Full Channel 08; on Massachusetts cable services: Comcast 819HD, Verizon 18 / 518HD; on satellite: DirecTV 36 / 3128HD, Dish Network 36. WSBE Learn transmits over the air on digital 36.2; on cable: Cox 808, Verizon 478, Full Channel 89, Comcast 294 or 312.